Its been three years since Cuban cuisine-lovers could duck into the Hard Grove Café in Jersey City for a traditional Cuban sandwich. Well, good news! 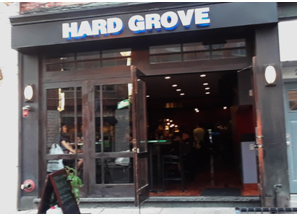 On June 26, Hard Grove opened its new restaurant & bar on First Street off Newark Ave, and so far, customers are stopping by for Hard Grove’s traditional Cuban fare and a freshly mulled Hemingway Mojito. Cuban Cuisine in Jersey CityCuban dining in Jersey CityHardgrove Cafe' in Jersey CityIs the Hardgrove Cafe in Jersey City still open?Sally DeeringTHE COMEBACK KID- Hard Grove Café Re-Hangs Its Cuban Star on First StreetWhere can I get great Cuban Food in Jersey City?Where did the Hardgrove Cafe move to?Who has the best Cuban Food in Jersey City?